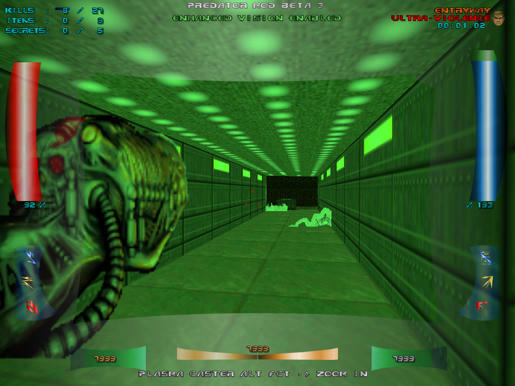 ZDoom • View topic - AvP 2.0 - JDREDALERT's Edition WIP Is Out For Testing !! AvP 2.0 - JDREDALERT's Edition WIP Is Out For Testing !! I wanted to play Doom as a Predator for awhile and there is no mod around where i could play as the Predator instead of the usual doomguy marine. 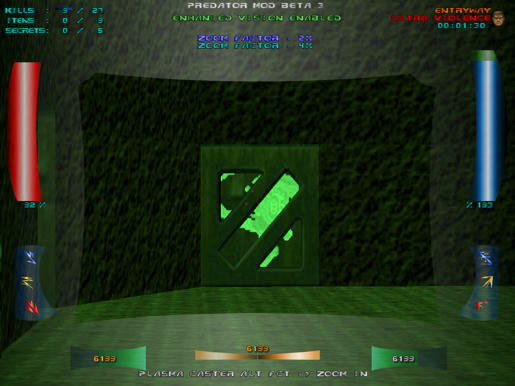 Of course there is some good AvP mods like AvPvT (which is really fun to play) but none of them is offering to play as the Predator. Due to my limited artistic skills there is some oddities in this mod and i apologize in advance in case it could irritate someone. 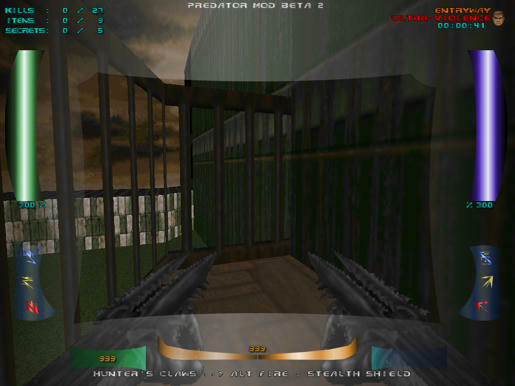 Note that the HUD is set to be displayed at a resolution of 1024x768 and lower resolution might result in the HUD not being displayed correctly. Belt Flashlight - well it's just an auto-recharging flashlight. Really bright light and use a vast amount of battery energy. NEW VIDEO COMING SOON !!! 15 - All 3 synthetic classes randomly explode after they been killed. DON'T STAY TOO CLOSE OF THEM !!! NOTE : All i did is merged the 2 mods and solved some bugs i came across along the way, all the hard work was done by fenderc01. Many small improvements and i got rid of all unused sounds. THIS IS THE LAST VERSION, i have no intention to continue improving it from now on. 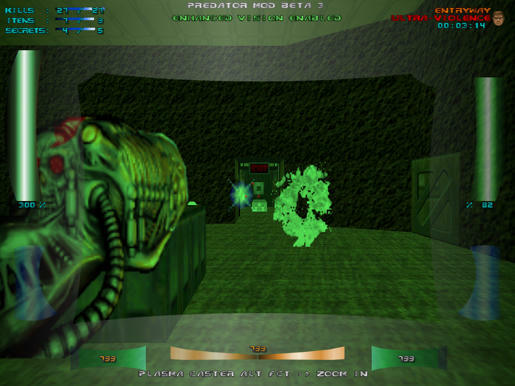 I will concentrate my efforts on the original AvP mod. 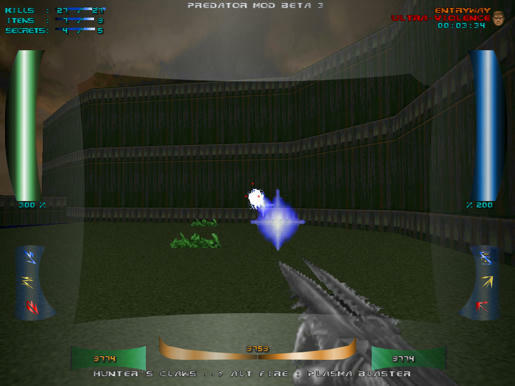 Bad - It will hit the closest enemy even if the player is aiming at a far away enemy. 2 - Smartdisc AUTO-TARGETS the closest enemy it locks on if that enemy is in line-of-sight, if none are it will seeks for a target and alters its trajectory toward it. Most useful with free mode, not as good with low and high modes. 3 - Modifications to the Xeno drones and warriors to prevent the state-lock bug and frame rate drop. 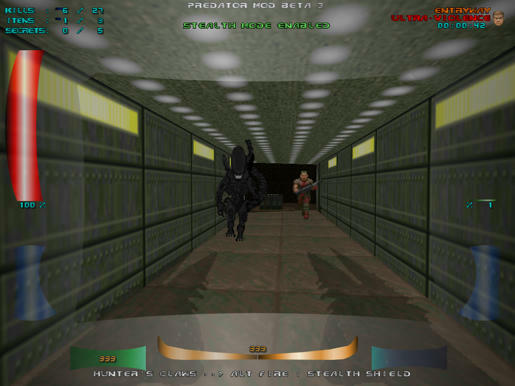 4 - Predator's HUD revamped once more with a black and blue tones combo. NOTE : Please report any bug you come across, it will help me to improve this mod and its variants to offer a better and more enjoyable mod. it gives a weapon at random from the class's arsenal. All weapons of the class are part of the lottery. Meaning if the player starts a new game with the Marine he could have the Minigun as starting weapon instead of the Pulse Rifle. Same for the Predator. Each new games start with a random weapon. Stealth is your best ally so be sure to manage your energy wisely. However sometimes it's better to make your way with the good old plasma blaster. 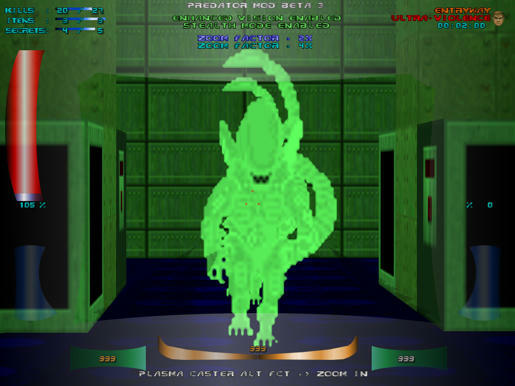 Use the Plasma Caster on bosses since it's the most powerful weapon in the Predator's arsenal and the damage and damage radius increase with the # of boosters you collect. Also the use your arsenal wisely too. Sometimes it's better to use the speargun with the rapid fire mode than using the raw power of the smartdisk. Use your thermal visions to spot enemies and reduce the risk of being caught off guard. Smart Discs has 3 modes : Normal shot(i think i could call it the random trajectory shot), the low profile shot - which hugs the floors at any height making it really effective in close area, cost 20 energy points per use and finally the high profile shot which is basically a ceiling shot - really effective against the flying aliens when they fly high and are out of reach of other weapons - also cost 20 energy points per use. The Combi-stick can be use in 2 ways : normal attack and throw attack. The throw attack is extremely effective against droids and strong monsters like the Praetorian and the Super-Runner - it can also freeze enemies nearby with its iceblast radius. Newly added for version 1.2 - each throw uses 150 energy points and can't be used if the remaining energy is bellow 150. Use the the Auto-Turrets wisely because they are really rare. You shouldn't run out of ammo but keep an eye on your reserve just in case because some maps are extremely greedy on ammo and have an insane amount of enemies. Flares now have 2 roles : Light up the way and a small explosion when they reach their time limit. Use them to get rid of monsters hidden behind a box. It won't always kills the monster but you'll be sure to hurt it enough to take it out without using too much ammo. Use the pounce attack to get out of range of the flamethrower droids. Use your bit attack to heal yourself. Use the acid spitting attack wisely because it causing HP loss each time and can eventually kills you. The Alien can climb really high and go where no other class can so use that ability to hide yourself if you are low on HP and take the time to regenerate. Find a berserk pack as soon as you can the have your speed and regeneration increased along with bite damage. If you have difficulty walking around and navigating due the the boosted speed you can nullify the speed effect by using the "sneak" mode once. This will return the xeno to its default speed while retaining the increased regeneration and bite damage. Like the Predator class, use your special vision to spot enemies easily and avoid being caught off guard. 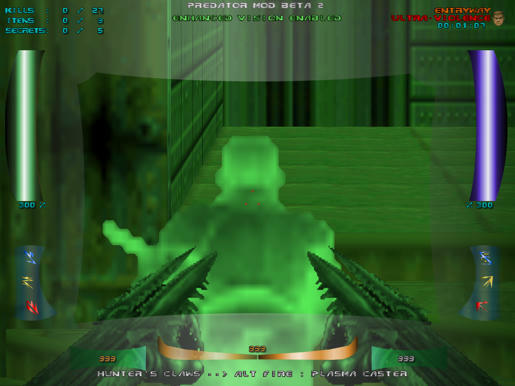 Note :Older versions of this mod can be played with a widescreen monitor as long as in zdoom the video resolution is set to 1024x768 and the "Force Ratio" option is disabled. That way it will show properly on widescreen monitors. Last edited by Endless123 on Mon Oct 09, 2017 2:32 pm, edited 205 times in total. Last edited by Tomicapo on Tue Jan 03, 2017 4:59 pm, edited 1 time in total. Tomicapo wrote: I need to say this mod is very promising so far i like your job!! Its awesome!! Thanks but to be honest there is still A LOT of work to do to make it a good Predator mod. I added a zoom to the PlasmaCaster and reworked the HUD once again. 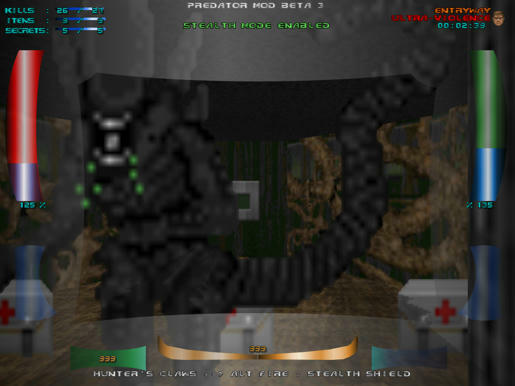 As you can see the problem is to remove the claw's sprite while in zoom view so i'm still working on that little thing. Kontra Kommando wrote: Wow, this look excellent! Speaking of aliens, i'm planning to add some in my mod so do you mind if i use yours? Of course i'll add your name in the credits if you are agree. BTW I'm also looking for more versatile claws(good predator's claws with a good animation seem to be rare - Lukas2288's claws are cool but the animation set is limited. I'm trying to rip the forearms of the predator of my AvP2 but i'm far from being successful to be honest. Yes, I would be honored to have my xenomorphs included into your WAD! I'm also making the warrior and the queen. The dog-xeno is going to be tough, but I'm going to give it my best. Once I've completed them, you can use them too, if you like. That is awesome! I can't wait to play! This will be part of the beta 3 when i'll release it. Damn nice!! Wanna try it now, looks so cool! So what do you think, shall i keep the regeneration or just remove it?